This is the first in a four-part theme week focused on the Spanish Flu and the newly launched Defining Moments Canada project. Over the past few years, anniversaries seem a dime a dozen. In 2017 alone, we’ve marked #Canada150, the centenary of the taking of Vimy Ridge, and the 35th anniversary of the Charter of Rights and Freedoms; in 2018 we look forward to marking one hundred years following the end of the First World War; and, no doubt, in 2019, the signing of the Paris 1919 Treaty of Versailles. As these anniversaries began to roll along, Blake Heathcote and I became concerned. Although the war and the constitution matter to Canadians, we heard little about marking another significant event that reshaped Canadian lives in the late-1910s: The Spanish Flu. When it was over, influenza had claimed as many as 50,000 Canadians and over 20 million people globally. When framed around the conflict in Europe, it is clear the event had similar implications. And yet, as we enter into 2018, there is relative silence about the subject. Over the past two years, Blake and I began to act on our concern. 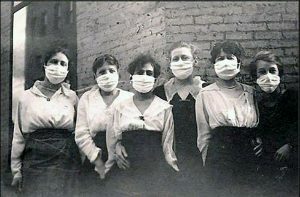 As we thought about the influence of the Spanish Flu, and began to discuss the subject with friends and colleagues, it became clear that everyone, it seems, has a Flu story. On the surface, many of these stories are just recitations of how badly one was affected by a case of the Flu last year, or how a good friend was struck down for several months and required time off work. Yet many more stories are contained in the deeper reaches of personal narrative, often stretching back to a great aunt who lost a sister after World War One, or a recollection about seeing an picture in a high school textbook and wondering what it might be like to wear such a mask for days on end. Challenge yourself, though, what do you really know about the Pandemic? 2018 begins the 100th Anniversary of the three waves of Influenza that swept a Canada consumed by world war and the internal divisions it exacerbated. 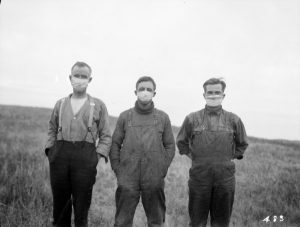 Arriving simultaneously with the enactment of the Military Services Act (January 1918), the spread of the Flu threatened the ‘hearth and home’ of every Canadian family in a way similar to that of the war. Over the course of the next 18 months, Defining Moments Canada will be curating micro-histories from across Canada, in an attempt to help Canadians tell stories of the Pandemic from wherever they live in the country. Along with our French language platform (Moments Déterminant Canada, online in February, 2018), our project aims to tell a truly national story. To do so, voices from the immigrant experience, from Indigenous communities, and remote and isolated regions in Canada must be heard. These are not simple tasks. Our researchers are embedded in archives in every province seeking those narratives. The goal is simple: use digital tools and research techniques to design crowd-sourced commemorative projects and feature them on our website. In so doing, we hope that Defining Moments Canada might provide the first truly ‘digital monument’ to honour the experiences that affected so many Canadians in decade following the war. Schools are an important part of our focus as we work to cultivate this moment of commemoration. We wondered how the Flu Pandemic has been taught in Canadian schools? To what extent is the “Pandemic Experience” (as we are calling it) represented in provincial curricula in History, Social Studies, Biology and Nutrition? Indeed, are the remarkable stories of Canadian endurance amidst the loss of 50,000 souls ever told in the Fine Arts or in Literature classes? I am thinking right now of Alice Munro’s riveting short story, “Carried Away”. The framework and content exists for such lessons, but have they been developed for the classroom? Our feeling is that the answer is ‘no.’ We’d like to change this. Building upon my own work in building the Digital Historian Project (DHP), when I was a teacher with the Upper Grand District School Board, our Spanish Flu project takes an interdisciplinary approach that specifically works to integrate numeracy skills, critical approaches to literature, public history experience, and historical thinking concepts. In so doing, it aligns with the the Council of Ministers of Education Canada (CMEC) recently published Six Pan-Canadian Global Competencies for the 21st Century. This document is beginning to have resonance in provincial curricula, yet may have a broader impact in the realm of digital education than anywhere else. The Pandemic affords students at all levels a dynamic opportunity for digital research. Acknowledging that many primary sources have yet to be digitized, activating students, museum educators, and community groups to undertake such work in 2018-19 can be every bit as much of a national commemoration as any plaque or monument. An exemplary project already exists with the Brant County Great War Centenary Association (featured on Active History in January 2016). Local history experts, teachers, and archivists are already hard at work identifying the primary data of the pandemic experience in and around Brantford. The Flu Stories yet to be told by such crowd-sourcing can become model testaments for the commemoration. Such is the nature of community-based history that Defining Moments Canada has as its goal. Starting in the Spring of 2018, this will also be the pursuit of an ambitious partnership with the Centre for Undergraduate Research and Learning (CURL) at Huron College in London. Working in collaboration with CURL, we hope to utilize the DHP model for experiential learning in commemorating the Pandemic. As graduates of the DHP have already demonstrated using an iBook platform, rich archival research can be used by students to tell powerful micro histories in engaging new ways: demonstrations of learning that promote the six global competencies. Historian Charlotte Gray recently opined that “anniversaries can be the enemy of good history.” Disappointed with both the intent and impact of the Canada150 commemorations, Gray nonetheless makes a worthy point about ascribing too much significance to such anniversaries. Historians, however, face a much greater challenge in the classroom: how to capture the imagination of the 21st century student. Community-based commemorative projects that situate history students in the driver’s seat of archival curation and digital design is not the only solution to this dilemma, but it is definitely not an enemy. Neil Orford is the program leader of Defining Moments Canada and a governor-general award winning high-school history teacher. He is a community associate in the Centre for Undergraduate Research Learning at Huron University College. This is really interesting. That flu changed the course of so many lives, something that I’ve come to understand in a very personal way. My grandmother’s first husband died in 1918, leaving her a widow (newly arrived in Canada from Central Europe) with 9 children. She married my grandfather two years later. And my mother, a foundling, was raised in a foster home run by a woman who was also widowed in the flu epidemic. If she hadn’t been a widow, I doubt she would have taken in foster children and given my mother the life she had. All images from this time period are out of copyright and are free to use and download high resolution files from our catalogue. I will watch your work on this important topic with interest. Warm regards Margaret Warren A/Director, Content Management, State Library of Queensland.